5 Ways To Pink Up! 1. Nail Polish. Easy and economical painting your nails can perk up your spirits. Essie®’s Ballerina Slipper is a pale pink as seen on Martha Stewart’s The Pink Show show this week. Find it in salons and stores like Trade Secret® for $8.99, or online best price at Amazon for $4.00 + shipping is around $7.00. 2. Apparel. J.Crew is taking an extra 30% off sale items. Use Promo Code: Extra30 at checkout. Selections on pink on sale include this wonderful go anywhere shift of embossed cotton piazza dress in tea rose, reg. $88.00, sale priced $19.99 +30% off= approx.$17.02+sh, sizes 0,2,10. Not your size? Don’t worry there are other selections in dresses and slacks pretty in pink. However, you must hurry, offer good only through today, March 12, 2010! 3. Jewelry. Gemstones are hot in jewelry this year and one of the most economical gemstones is rose quartz. MarkdownMom found these classic 14kt gold over sterling rose quartz earrings, a full 1.0″ long and 0.5″ width for only $15.99 at Target. 4. Shoes. How cute are shoes this season? Oh, so cute in pink! 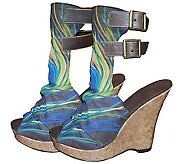 One of the many selections from Zappos, these platform heels have it all. A little naughty, but more Haughty these 5″, 1″ platforms from Chinese Laundry are peep toed, wrap heel, cut-out design with a back zip! 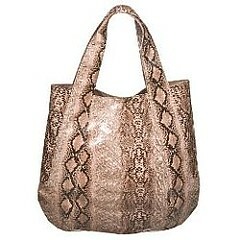 In fuschia, reg.$88.95, on sale $73.12. 5. Handbags. 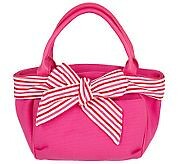 Just in time for the Easter Parade is this adorable tote at QVC. 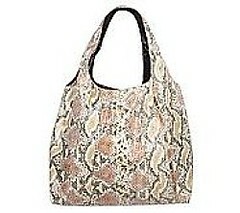 F by Fortuna Valentino Canvas Tote w/ Bow, reg. $44.00, sale $36.50. So Many Fabulous Pink Fantasies ! Whether you are an evolutionist or creationist, both can agree whatever the design source all of us have had back problems. Nothing is worse than having to sit at a desk day in and day out, or in your car in traffic for hours on end with an achy, breaky back! Doesn’t back pain make your brown eyes blue with the pain? QVC has got a great deal to help lessen that condition with this adjustable back rest. Now you can buy those fancy motorized, messaging, back supports–but a good one will run you up to $100. And your comfy favorite chair is hardly portable to bring with you. Take the pain out wherever you are with these portable mesh back rests. 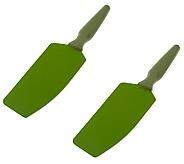 In this package deal get 2 back supports for $15.62+sh. Just think one for the office, and one for the car. Markdown Mom bought a set for her college kids and one set for her and hubby. Taking The Pain Out Of The Holidays One Sore Back At A Time!